The international human rights movement was strengthened when the United Nations General Assembly adopted of the Universal Declaration of Human Rights (UDHR) on 10 December 1948. Drafted as ‘a common standard of achievement for all peoples and nations’, the Declaration for the first time in human history spell out basic civil, political, economic, social and cultural rights that all human beings should enjoy. It has over time been widely accepted as the fundamental norms of human rights that everyone should respect and protect. The UDHR, together with the International Covenant on Civil and Political Rights and its two Optional Protocols, and the International Covenant on Economic, Social and Cultural Rights, form the so – called International Bill of Human Rights. A series of international human rights treaties and other instruments adopted since 1945 have conferred legal form on inherent human rights and developed the body of international human rights. Other instruments have been adopted at the regional level reflecting the particular human rights concerns of the region and providing for specific mechanisms of protection. Most States have also adopted constitutions and other laws which formally protect basic human rights. While international treaties and customary law form the backbone of international human rights law other instruments, such as declarations, guidelines and principles adopted at the international level contribute to its understanding, implementation and development. Respect for human rights requires the establishment of the rule of law at the national and international levels. International human rights law lays down obligations which States are bound to respect. By becoming parties to international treaties, States assume obligations and duties under international law to respect, to protect and to fulfil human rights. The obligation to respect means that States must refrain from interfering with or curtailing the enjoyment of human rights. The obligation to protect requires States to protect individuals and groups against human rights abuses. The obligation to fulfil means that States must take positive action to facilitate the enjoyment of basic human rights. Through ratification of international human rights treaties, Governments undertake to put into place domestic measures and legislation compatible with their treaty obligations and duties. 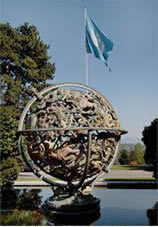 Where domestic legal proceedings fail to address human rights abuses, mechanisms and procedures for individual complaints or communications are available at the regional and international levels to help ensure that international human rights standards are indeed respected, implemented, and enforced at the local level.